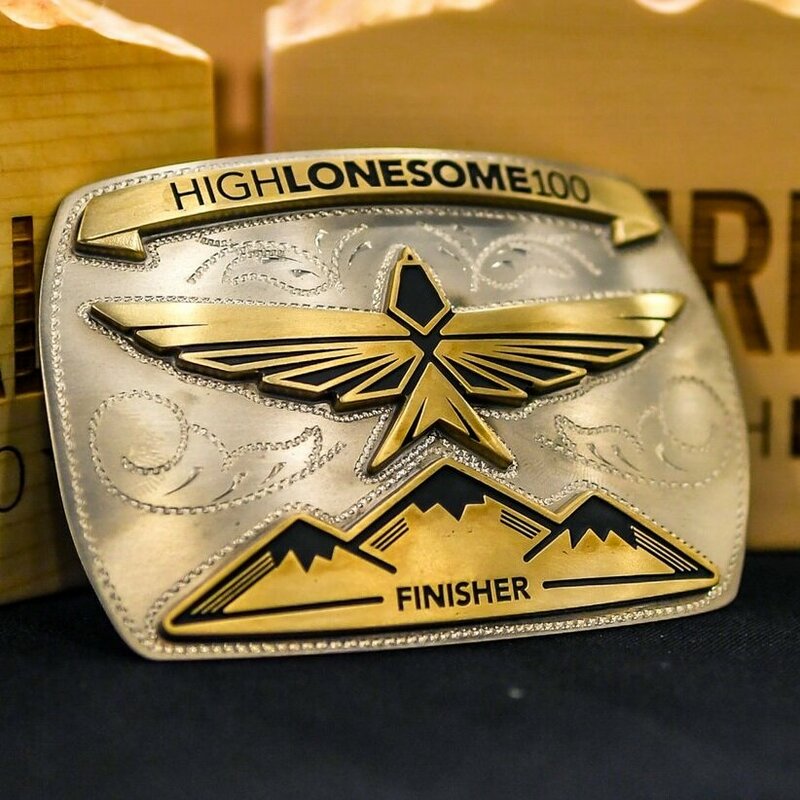 If you're tough enough to run 100 miles at altitude in the heart of the Colorado Rocky Mountains, then you deserve a hell of a buckle. We also think you deserve something just for being brave enough to toe the starting line, which is why every runner gets a custom engraved bottle of Laws 4 Grain Small Batch Whiskey. And to really round it out, we've got place awards made locally from beetle-kill pine for the top three men and women! Each person to complete the High Lonesome 100 endurance race within the cut offs receives a handmade (in Colorado) belt buckle! Buckles are awarded when you finish. Multiyear finish buckles are given to runners with repeat finishes. Made by Colorado Silver Star Corporation, Denver Colorado. We teamed up with Laws Whiskey House to get each runner a specially engraved bottle of their Four Grain Small Batch Bourbon. Like the High Lonesome 100, Laws is pure Colorado goodness. Every runner who starts the race will receive a bottle. This is an award any ultra runner will want to add to their collection! Bottles are given out at the awards ceremony. Distilled, aged, bottled, and engraved in Denver, Colorado. If you're one of the lucky top three men or women, then you get a place award made by local artists with local beetle kill pine. The awards are 3D topographical renderings of the mountains that runners just ran through. Made by Precision Peaks, Leadville Colorado. The whiskey bottles can't be mailed, so they must be picked up in person at the awards ceremony. Bottles won't be given out early unless there are very special circumstances. Belt buckles can be mailed for $20 and podium awards can be mailed for $30. Hugging the RD is required to receive any of the prizes.